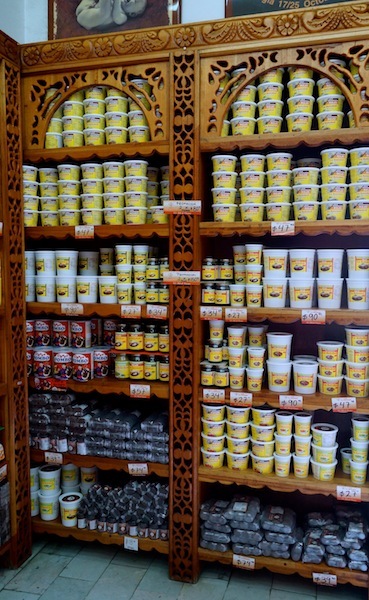 If Tabasco is the biggest Cocoa and Chocolate producer state, Oaxaca is without a doubt the biggest consumer of both in the whole of Mexico. The consumption of cocoa in the form of hot chocolate was always very strong here. It began with the farmers who would start the day with a cup of hot chocolate made with water. The hot chocolate gave them the necessary energy in the first morning hours. They got up very early, around three in the morning to go to the fields which would often be one or two hours away. The hot chocolate kept them going until breakfast later in the morning. 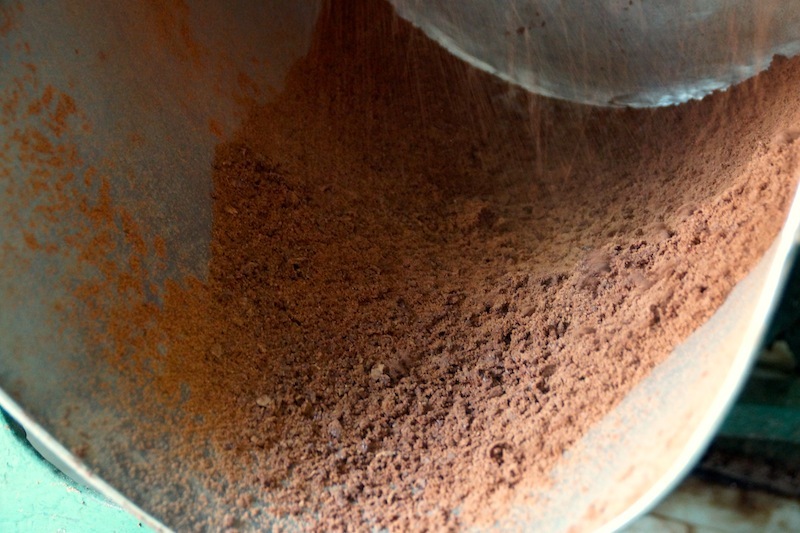 In the old days women would buy their cocoa beans and ground them at home using the metate. This is my modern metate bought in Oaxaca and still in use in many parts of Mexico. It was a time consuming and very hard task as you can imagine. There are still people who do it today but most prefer to get their cocoa or special grounded mixtures of cocoa beans, nuts and sugar from specialty chocolateries. The La Soledad owner’s grandfather was the pioneer, the first one to offer grinding machines to grind the cocoa beans in the 1930’s. Initially Henrique Pombo Ramirez and his wife had a grinding business for corn, dried grains and chiles. His clients would often ask him to grind their cocoa beans but due to its characteristics it was difficult to find the best way to grind it. He experimented until he managed to suitably adapt the grinder. Initially the people would bring their own ingredients, cocoa beans and sugar. After the grinding they would take the paste home and would pass it one more time in their metate to make it smooth. Then the owner’s grandfather started offering two grindings. The first one to grind and bind the ingredients and the second one to make the paste smooth. 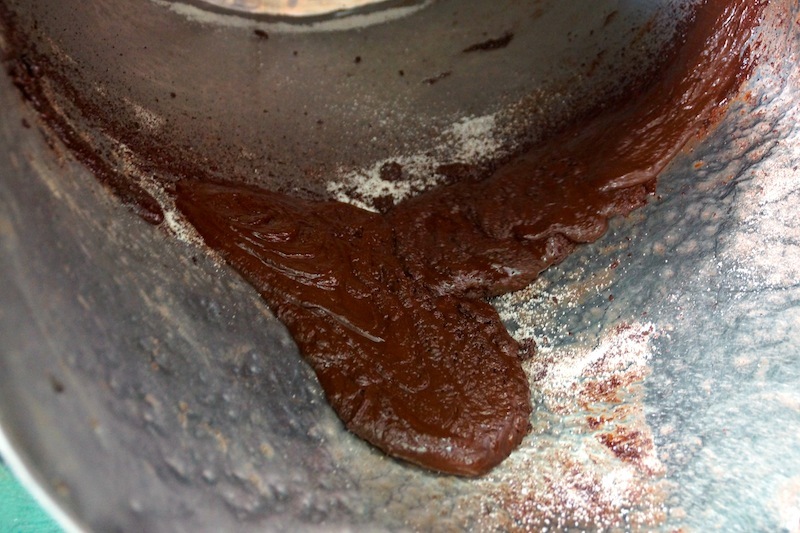 All people had to do was to get home and shape the chocolate paste according to their taste and needs. This could be done in tablets, spheres or ball shaped. 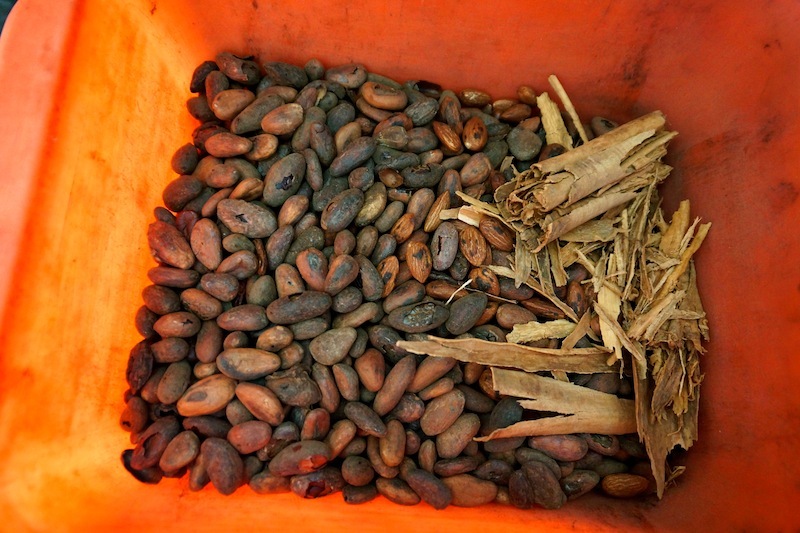 Soon the population of the surrounding pueblos started taking their cocoa beans to him. In time they would no longer bring their own ingredients but would buy them from the owner’s grandfather trusting him with the quality of the ingredients and grinding. The most classic combination is cocoa beans, sugar, cinnamon and almonds. That is how La Soledad as a business was born. 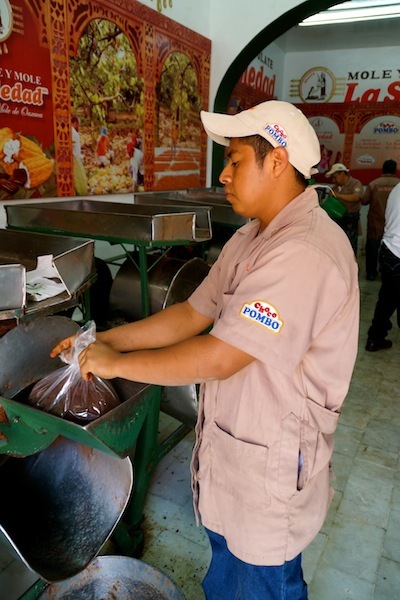 Former employees of Henrique Pombo later started their own grinding business and chocolateries that you can also find in Oaxaca. 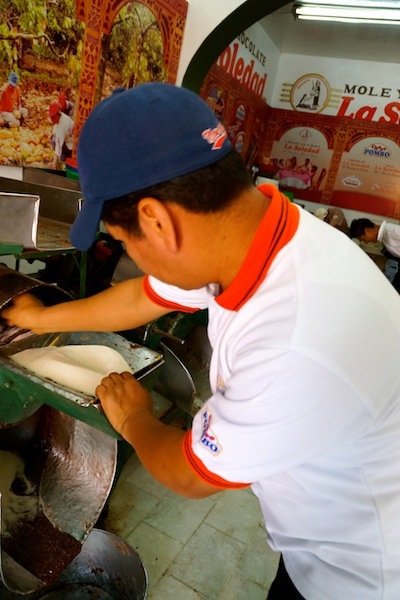 However, La Soledad prides itself on its pioneering enterprise and on keeping their traditional methods alive. Clients have remained faithful and they reciprocate by offering a wide array of choices. They always maintain the highest quality in contrast with others that have become more industrialized. 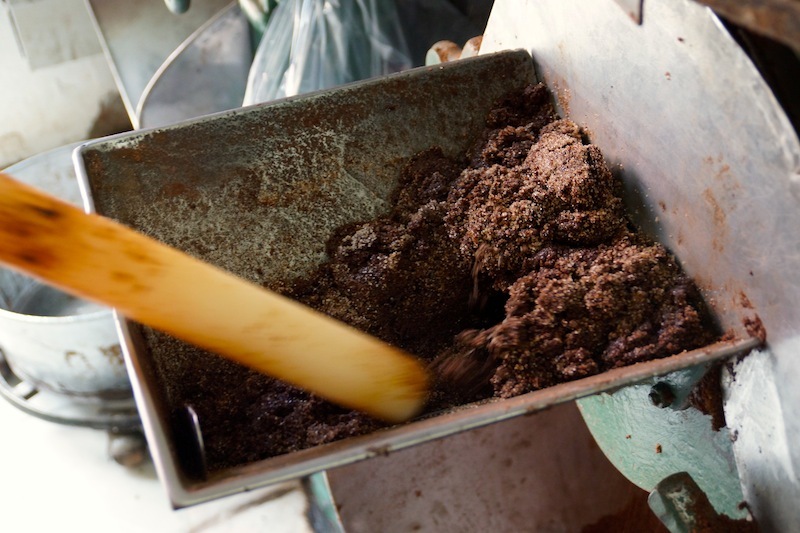 According to the owner, people in Oaxaca prefer to grind the beans whole without removing the outer skin. 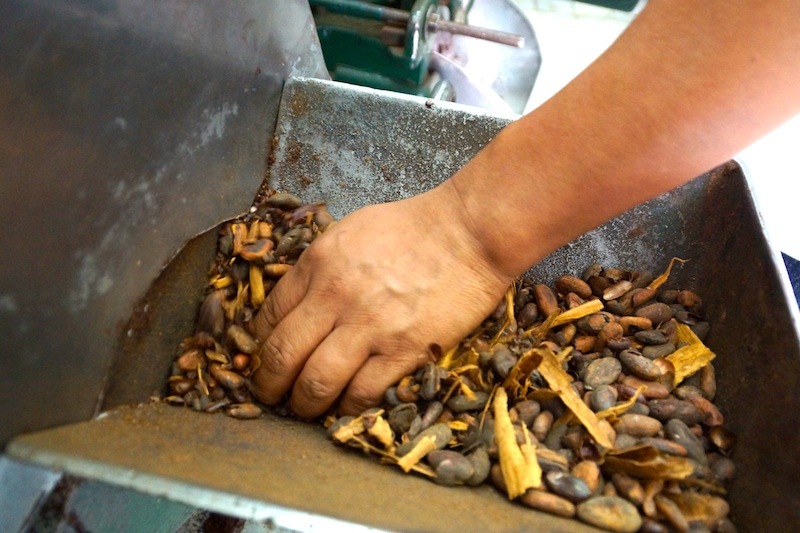 You begin by putting the whole cocoa beans with almonds and cinnamon sticks in the grinding machine. It is now ready to take home where you will make a wonderfully aromatic and tasty hot chocolate. Later they also started getting requests to grind moles (special thick sauces made with different chiles and spices. They are often used in Mexican cuisine in a variety of dishes) and now they produce their own moles. The most famous mole in Oaxaca is the black mole which is made with a great quantity of chocolate, spices and chiles. It is rich, chocolaty with just the right amount of spiciness. These are some of the moles they sell in their shop, I couldn’t resist and besides the chocolate, I also bought a few to bring home. 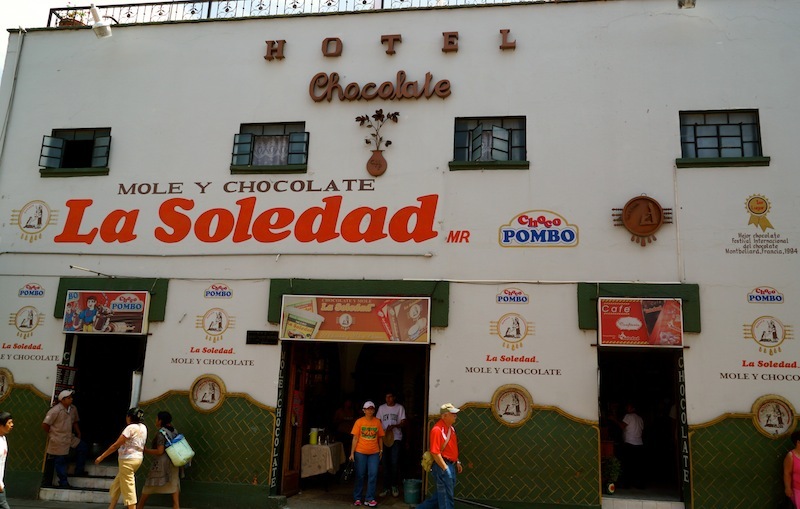 La Soledad also prides itself on their chocolate being available in remote villages in the state of Oaxaca. They have remained a small, family business which also tries to introduce innovations and new products. The owner, Eng. 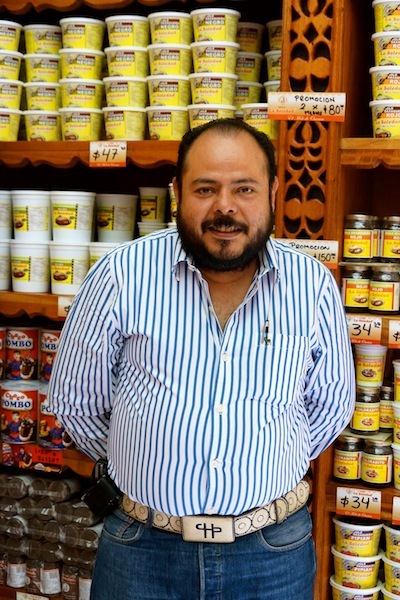 Horacio Chavez Pombo who graciously took the time to tell us about his heritage and business. He was kind enough to offer us a taste of their hot chocolate and we loved the rich taste and great quality. So did my daughter who tried the hot chocolate line for children and was delighted. 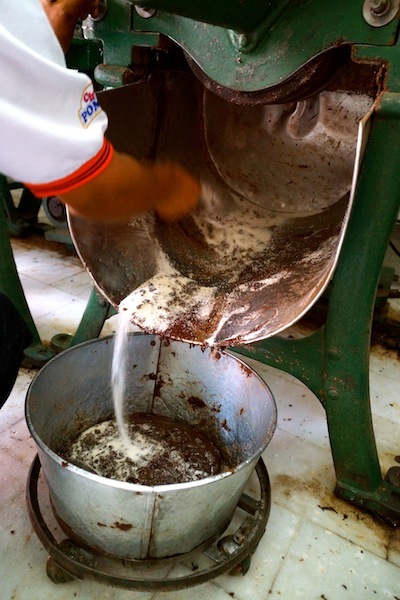 It was great to have the opportunity to learn more about the history of chocolate in Oaxaca and to find out how tradition and family still play such a pivotal role. Hello! 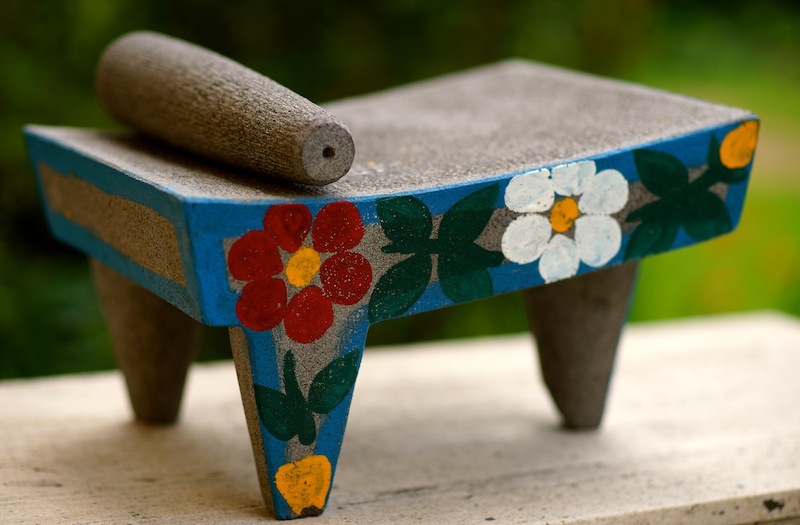 I am trying to locate a Oaxacan metate like the one you have. Do you know of any other places in America I can locate one. I have my abuelitas metate that belonged to her mother which I use for making tortillas but I want the more fine stone Oaxaca metate for chocolate making. Blessings!